Description: This tutorial teaches FIWARE users about CRUD Operations. The tutorial builds on the data created in the previous stock management example and introduces the concept of CRUD operations, allowing users to manipulate the data held within the context. Within the FIWARE platform, an entity represents the state of a physical or conceptual object which exists in the real world. Store name, e.g. "Checkpoint Markt"
Address, e.g. "Friedrichstraße 44, 10969 Kreuzberg, Berlin"
Shelf name, e.g. "Wall Unit"
As you can see, each of the entities defined above contain some properties which are liable to change. For example, product price could change, stock could be sold and the number of items on the shelves would drop. This application will only make use of one FIWARE component - the Orion Context Broker. Using the Orion Context Broker is sufficient for an application to qualify as “Powered by FIWARE”. Since the two components interact by means of HTTP requests, they can be containerized and run from exposed ports. Both containers reside on the same network - the Orion Context Broker is listening on port 1026 and MongoDB is listening on the default port 271071. For the sake of this tutorial, we have also made the two ports available from outside the network so that cUrl or Postman can access them without having to be run from inside the network. The command-line initialization should be self explanatory. Create, Read, Update and Delete are the four basic functions of persistent storage. These operations are usually referred to using the acronym CRUD. Within a database each of these operations map directly to a series of commands, however their relationship with a RESTful API is slightly more complex. The Orion Context Broker uses NGSI to manipulate the context data. As a RESTful API, requests to manipulate the data held within the context follow the standard conventions found when mapping HTTP verbs to CRUD operations. For operations where the <entity-id> is not yet known within the context, or is unspecified, the /v2/entities endpoint is used. Once an <entity-id> is known within the context, individual data entities can be manipulated using the /v2/entities/<entity-id> endpoint. It is recommended that entity identifiers should be URNs following the NGSI-LD specification, therefore each id is a URN which follows a standard format: urn:ngsi-ld:<entity-type>:<entity-id>. This helps making every id in the context data unique. POST CREATE a new entity and add to the context. CREATE or UPDATE an attribute of a specified entity. GET READ entity data from the context. This will return data from multiple entities. The data can be filtered. READ entity data from a specified entity. This will return data from a single entity only. The data can be filtered. To perform CRUD operations on attributes, the <entity-id> must be known. Each attribute is effectively a key-value pair. /v2/entities/<entity-id>/attrs is only used for a patch operation to update one or more exisiting attributes. /v2/entities/<entity-id>/attrs/<attribute> is used to manipulate an attribute as a whole. /v2/entities/<entity-id>/attrs/<attribute>/value is used to read or update the value of an attribute, leaving the type untouched. GET :x: :x: READ the value of an attribute from a specified entity. This will return a single field. PUT :x: :x: UPDATE the value of single attribute from a specified entity. Additionally the Orion Context Broker has a convenience batch operation endpoint /v2/op/update to manipulate multiple entities in a single operation. entities is an array of objects holding the list of entities to update, along with the relevant entity data used to perform the operation. The following examples assume that the Orion Context Broker is listening on port 1026 of localhost, and the initial seed data has been imported from the previous tutorial. Create Operations map to HTTP POST. 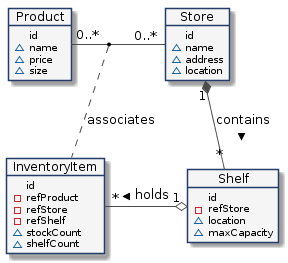 Any newly created entity must have id and type attributes, other attributes are optional and will depend on the system being modelled. If additional attributes are present though, each should specify both a type and a value. The response will be 204 - No Content if the operation is successful or 422 - Unprocessable Entity if the operation fails. This example adds a new Product entity ("Lemonade" at 99 cents) to the context. New entities can be added by making a POST request to the /v2/entities endpoint. The request will fail if any of the attributes already exist in the context. This example adds a new specialOffer attribute to the existing Product entity with id=urn:ngsi-ld:Product:001. New attributes can be added by making a POST request to the /v2/entities/<entity>/attrs endpoint. The payload should consist of a JSON object holding the attribute names and values as shown. If no type is specified a default type (Boolean, Text , Number or StructuredValue) will be assigned. Subsequent requests using the same id will update the value of the attribute in the context. As you can see there is now a boolean specialOffer flag attached to the "Beer" Product entity. This example uses the convenience batch processing endpoint to add two new Product entities and one new attribute (offerPrice) to the context. actionType=append_strict means that the request only succeeds if all entities / attributes are new. The entities attribute holds an array of entities we wish to create. Subsequent requests using the same data with the actionType=append_strict batch operation will result in an error response. This example uses the convenience batch processing endpoint to add or amend two Product entities and one attribute (offerPrice) to the context. if an entity already exists, the request will update that entity's attributes. if an entity does not exist, a new entity will be created. The entities attribute holds an array of entities we wish to create/overwrite. A subsequent request containing the same data (i.e. same entities and actionType=append) won't change the context state. This example reads the full context from an existing Product entity with a known id. Context data can be retrieved by making a GET request to the /v2/entities/<entity> endpoint. This example reads the value of a single attribute (name) from an existing Product entity with a known id. Context data can be retrieved by making a GET request to the /v2/entities/<entity>/attrs/<attribute>/value endpoint. This example reads the key-value pairs of two attributes (name and price) from the context of existing Product entities with a known id. Combine the options=keyValues parameter with the attrs parameter to retrieve key-value pairs. This example reads the value of two attributes (name and price) from the context of existing Product entities with a known ID. Combine the options=values parameter and the attrs parameter to return a list of values in an array. This example lists the full context of all Product entities. On start-up the context held nine products, three more have been added by create operations so the full context will now contain twelve products. This example lists the name and price attributes of all Product entities. Full context data for a specified entity type can be retrieved by making a GET request to the /v2/entities endpoint and supplying the type parameter, combine this with the options=keyValues parameter and the attrs parameter to retrieve key-values. This example lists the id and type of all Product entities. Context data for a specified entity type can be retrieved by making a GET request to the /v2/entities endpoint and supplying the type parameter. Combine this with options=count and attrs=id to return the id attributes of the given type. Overwrite operations are mapped to HTTP PUT. HTTP PATCH can be used to update several attributes at once. Existing attribute values can be altered by making a PUT request to the /v2/entities/<entity>/attrs/<attribute>/value endpoint. This example simultaneously updates the values of both the price and name attributes of the Entity with id=urn:ngsi-ld:Product:001. This example uses the convenience batch processing endpoint to update existing products. Batch processing uses the /v2/op/update endpoint with a payload with two attributes - actionType=append means we will overwrite existing entities if they exist whereas the entities attribute holds an array of entities we wish to update. This example uses the convenience batch processing endpoint to replace entity data of existing products. Batch processing uses the /v2/op/update endpoint with a payload with two attributes - actionType=replace means we will overwrite existing entities if they exist whereas the entities attribute holds an array of entities whose data we wish to replace. Delete Operations map to HTTP DELETE. The response will be 204 - No Content if the operation is successful or 404 - Not Found if the operation fails. If there are entities within the context which relate to one another, you must be careful when deleting an entity. You will need to check that no references are left dangling once the entity has been deleted. Organizing a cascade of deletions is beyond the scope of this tutorial, but it would be possible using a batch delete request. This example deletes the entity with id=urn:ngsi-ld:Product:001 from the context. Entities can be deleted by making a DELETE request to the /v2/entities/<entity> endpoint. Subsequent requests using the same id will result in an error response since the entity no longer exists in the context. This example removes the specialOffer attribute from the entity with id=urn:ngsi-ld:Product:001. Attributes can be deleted by making a DELETE request to the /v2/entities/<entity>/attrs/<attribute> endpoint. If the attribute does not exist in the context, the result will be an error response. This example uses the convenience batch processing endpoint to delete some Product entities. Batch processing uses the /v2/op/update endpoint with a payload with two attributes - actionType=delete means we will delete something from the context and the entities attribute holds the id of the entities we wish to delete. If an entity does not exist in the context, the result will be an error response. This example uses the convenience batch processing endpoint to delete some attributes from a Product entity. Batch processing uses the /v2/op/update endpoint with a payload with two attributes - actionType=delete means we will delete something from the context and the entities attribute holds an array of attributes we wish to delete. If any attribute does not exist in the context, the result will be an error response. This example returns the key of all entities directly associated with the urn:ngsi-ld:Product:001. If the response lists a series of InventoryItem entities they should be deleted before the associated Product entity is removed from the context. Note that we deleted Product urn:ngsi-ld:Product:001 earlier, so what we see above is actually a dangling reference, i.e. the returned InventoryItem references a Product that no longer exists.